HITEK-nology Solutions Ltd was set up to be the "doing" arm of HITEK Electronic Materials Ltd and to "boldly go and do the job-because we can" and since its inception has introduced innovative solutions to the MoD designed to combat corrosion using CORTEC's VpCI range of corrosion inhibitors and Precision Dynamics Dynamic Descaler to remove scale and bio-fouling from Heat Exchangers, Evaporators, and boilers etc using environmentally friendly materials. Before using Dynamic Descaler®. After using Dynamic Descaler®. Biodegradable. Won't harm the environment. Economical. Compare cost to other products and cleaning options. Fast. Equipment is cleaned within a few hours. Superior corrosion inhibitors. 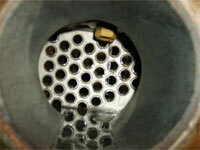 Lowest corrosion rate of any descaler. Powerful detergents and penetrating agents. 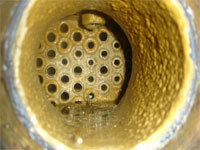 Corrosion costs industry billions of pounds each year. HITEK-nology Solutions Limited can, using Cortec’s VpCI products, prevent assets and high value spares from corroding, we can also reclaim parts etc. that have corroded. This both saves money and increases the life of the equipment. VpCIs are environmentally friendly and have little or no Volatile Organic Compounds (VOCs). VpCI can be delivered in a variety of ways, including misting, fogging, spraying, brushing, dipping and wrapping etc. Depending on the individual task would dictate the method used and the type of product chosen. 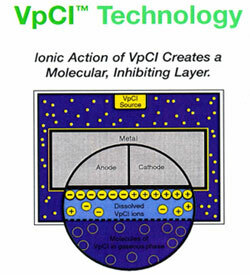 VpCIs are available in such forms as powders, liquids, emitters, impregnated paper, plastics and cardboard etc. and can give protection in any environment for up to 25 years. VpCI works by conditioning the enclosed atmosphere with a protective vapour which migrates to all recessed areas and cavities, the vapour condenses on the metal surface and the ions dissolve in the moisture layer (water electrolyte). These protective ions are attracted to the metal surface forming a monomolecular protective layer, this protective layer re-heals and self replenishes through further condensation of the vapour. The picture below shows this. HITEK-nology Solutions Limited is the only approved European applicator of the Cortec Corporation VpCI products.